Greetings one and all! I hope you are doing well and loving life. Once again, I invite you to take a deep breath, pour a cup of coffee or hot tea, and relax. With the arrival of Fall, change is in the air! Leaves are changing. Light is changing. Sounds are changing. Temperatures are changing. With any kind of change, we know that something ends and something new begins. Although Fall is my favorite time of year, there are some aspects about summer that I will miss. 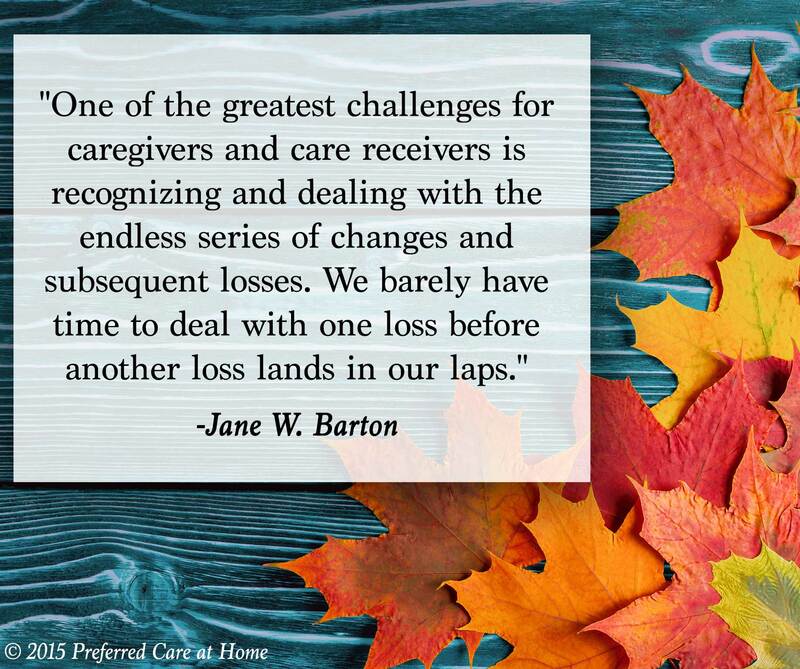 This seasonal sense of loss serves to remind me of the myriad of losses experienced by caregivers and care receivers. Loss—it’s not a pleasant proposition. However, loss is an inherent aspect of the lived experience. Because life is a continuous process of change, we will experience a multitude of losses throughout the journey. When change happens, by definition, something ends! Caregiving intensifies the experience of loss. The magnitude of losses posed by aging and illness within a compressed time frame is often overwhelming for all concerned. The losses weigh heavy on our hearts, confound rational thoughts, and derail previous plans. One of the greatest challenges for caregivers and care receivers is recognizing and dealing with the endless series of changes and subsequent losses. We barely have time to deal with one loss before another loss lands in our laps. Some losses are devastating (the death of a loved one) while other losses are frustrating (inability to drive). Whatever the loss, we grieve. Over the past decade, I have spent the majority of my time creating and presenting educational programs about the issues of aging, caregiving, and the end of life. When presenting programs on loss and grief, I realize that most people attending expect the discussion to be focused exclusively on the ultimate loss—death. However, as previously noted, we grieve all kinds of losses. In order to integrate loss into our lives, we must recognize the loss, acknowledge our grief, and then mourn. So, let’s consider—What do we have to lose? Although this list is not comprehensive, it’s obvious that we have a LOT to lose over the course of a lifetime. The goal is not to avoid loss, but rather to recognize, to integrate, and to mourn our losses. By so doing, we are then able to transition from “what was” to “what is.” Similar to the seasonal changes, transitions from one season to another result in some things being lost while others things are gained. As we experience losses of all kinds, we are wise to embrace the blessings afforded by the new season. Yes, we have much to lose. But, we also have much to gain. A perspective worthy of consideration.